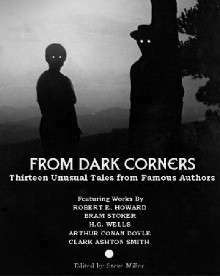 From Dark Corners is a budget-priced anthology featuring horror stories from prolific early genre writers known today primarily for a handful of creations, like Sir Arthur Conan Doyle (creator of Sherlock Holmes), Robert E. Howard (creator of Conan the Barbarian), Bram Stoker (creator of Dracula) and H.G. Wells (groundbreaking science fiction novelist best remembered for War of the Worlds and The Time Machine). Within are a selection of three offbeat stories of terror and fear from each author, along with a special surprising thirteenth tale from fantasy writer Clark Ashton Smith, plus brief author bios and a preface by editor Steve Miller. Check out the other budget-priced PDF fiction eBooks from NUELOW Games. Perfect for reading on the iPad! This title was added to our catalog on August 05, 2011.